My copy has a unique black inner sleeve, curious if others have this as well. The cover art gives you a good idea of the sound of this album, made while Budd was living in the UK in the mid-eighties, friendly with Cocteau Twins, sharing their otherness. This record is one of the heavy hitters in Budd's catalogue, along with Plateaux Of Mirror, Perhaps, Nighthawks, and of course Mysterious Skin. The White Arcades stands alone, wintry and haunted. Possibly goth. If somehow it were a rock album (it isn't), with singing and drums, it would be as celebrated as Disintegration or Medusa. It's just Harold at the keys, though, with cool effects and layers. 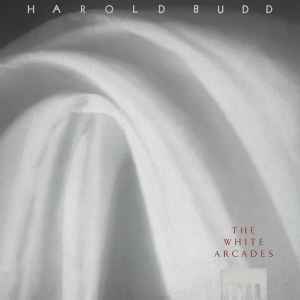 Harold Budd's music, whatever it's called, is not what people say it is. That's what he says anyway. And this album is a cave of ice, a garden of ice, glowing in the dark.